’37 Cellars came about when two brothers-in-law, decided to make their own premium, hand-crafted wine so they could enjoy more of it and share it with friends. Chuck and Frank were fortunate enough to learn their craft by working with winemaker Rob Newsom of Boudreaux Cellars who learned his craft from Gary and Chris Figgens of Leonetti Cellars. After a couple of years of learning their craft with Rob, in 2005, Frank and Chuck's passion and desire to make more wine and make it available to other people let to the formation of '37 Cellars. 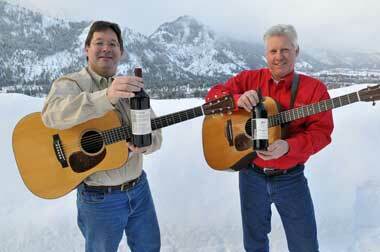 In naming their winery '37 Cellars, both Chuck and Frank, who own 1937 vintage guitars, pay homage to the Golden Era of guitar-making by crafting wines with the same level of detail and excellence as the master guitar makers of the past. Their philosophy is simple: buy the best fruit possible from some of the very best vineyards in the state and then give it the TLC it needs until ready for bottling. Their wines can be tasted at The Chamber Tasting Room in downtown Wenatchee or by calling the winery for an appointment at 509-548-8663. We hope you will enjoy our wines as much as we do!